Purple varieties do better at higher altitudes areas than the yellow types which does well in warmer areas. Yellow types tend to yield higher and are more resistant to diseases. Altitude – Passion fruits do well in a wide range of altitudes from 1,200m to 1,800m above sea level East of the Rift Valley and up to 2,000m above sea level West of the Rift valley. Temperature – Optimum temperature for purple passion fruit is between 18oC to 25oC and 25oC to 30oC for yellow passion fruit. Rainfall – Rainfall should be well-distributed, between 900mm to 2,000mm per year. Excess rainfall causes poor fruit set and encourages diseases mainly leaf and fruit rusts. Soil – Passion fruits do well in a variety of soils, which should be reasonably deep and fertile with the soil pH in the range of 6.0 to 6.5. Soil which are very acidic tend to reduce the uptake of the nutrients and also accelerates Fusarium wilt disease that causes rotting of roots. 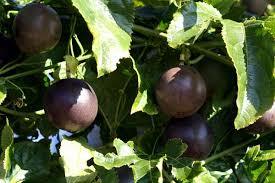 Passion fruit can be grown from seeds but we graft to produces improved stock. Yellow passion fruit is best for production of root stock because of superior disease resistance while purple is good for fruit production. To reduce the germination period, we soak the seeds in water for 24 hours. After 3-4 months we transplant them to a suitable place in the farm since they will act as a source of scions. We then sow the seeds of yellow passion fruit in plastic sleeves similar to those that we use for purple passion. An important distinction between the seeds of the two varieties is, Yellow passion seeds are brown in color, while those of the purple passion are black in color. Fresh seeds tend to germinate faster than older seeds therefore using them saves about 1 week. This process involves the choosing the correct rootstock and scion and identifying the most appropriate and common grafting technique is wedge grafting. Success of the graft union depends on the experience of the farmer, the choice of rootstock and scion, management practices such as watering and cleanliness of graft union. We graft yellow passion seedling when it attain a thickness of pencil since a thin, fleshy stem reduces the chances of successful graft union. Fleshy stems are prone to excessive transpiration thus leading to graft union failure. Once we select a suitable rootstock with the aforesaid qualities it is it defoliated, terminal end removed leaving a 8 cm long stem. We select a scion of the same thickness of a pencil from an existing purple passion plant that is healthy and free from pests and diseases. The stem must be woody enough and have 2 to 3 buds and we completely defoliate reduce its rate of respiration. We cut the basal end into a wedge shape that is 2 cm long to allow the xylem and the phloem vessels to be in contact with those of the rootstock. We then cut a slit of about 2 cm long on the rootstock using a clean surgical blade, in which a fitting scion from purple passion is inserted and tied. The graft joint is wrapped tightly using a plastic tape to ensure no air, water or fungi goes through the joint. After 3 weeks the graft union is healed we do the hardening of the plant before it is transplanted. We transplant our seedlings at the beginning of the rainy season around April-June or on any other month depending on availability of irrigation water. Passion fruit has deep roots, so soils should be well-tilled. We elect posts to a field having wire trellis to support the growing crop and fruits produced. Passion vines are planted 2m from one row to the other and 3m from one plant to the other. The vines are usually directed so that growth is in both directions along the supporting wires. Yields are highest following a regular fertilization regime. Old or dead shoots are pruned. We also inter crop with vegetables or other annuals is to utilize free space especially when the crop is young. Once established, the vines grow rapidly and the fruit should flower after about seven months. Ideally, young passion vines should be set in the field early in the growing season after there is no danger of drought.